Bad Black's baby born two weeks back is tending to a relatively light colour prompting the mom to add the Greenhalgh name as her last name. 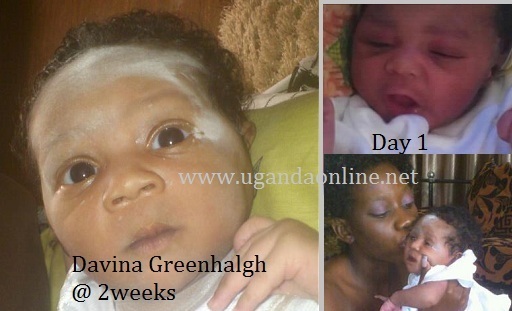 Greenhalgh is still stuck to his guns that the baby is not his after Bad Black tried talking to him about Davina yesterday at the Anti Corruption Court. Kim Swagga's girl friend had part ways with the self styled fashionista after he was linked to Bad Black's baby. But if the baby becomes slightly lighter than this, Kim Swagga might be pardoned and his password re-activated bearing in mind that he is dark and the baby is now tending to David Greenhalgh's side. David though seems to be concentrating on the embezzlement case more than anything for now. According to Bad Black, he paid all the hospital bills. Bad Black adds that Greenhalgh was not siding with those who were saying that the baby is dark. In another few weeks as the baby grows, it will be clear who the father is though David still maintains that he was last with Lady B in 2012. Watch this space!